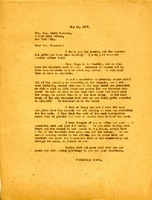 A letter to Mrs. Hammond from Miss Martha Berry in response to the telegram that Mrs. Hammond and the pilgrims sent her. 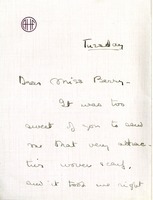 She responds by informing her of her slow recovery from illness. 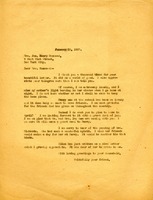 A letter explaining to Mrs. Hammond that a reply to Mrs. Shoemaker will be enclosed with this letter. 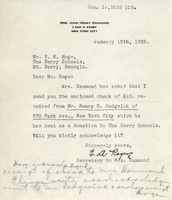 A letter to Mr. Hoge asking to acknowledge a donation made to the Berry Schools from Henry R. Sedgwick. Roger via Mrs. John Henry Hammond. 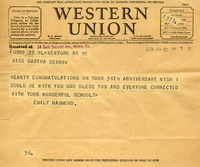 Emily Hammond sends her congratulations on the School's 36th anniversary. 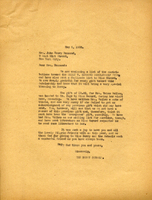 Helen Hitchcock writes Emily Hammond to tell her about an exhibit being put on at the Art Center by the Colonial Dames' titled, "Gates of Opportunity." 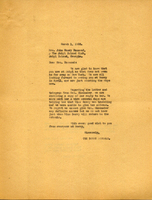 She says that exhibit reminds her very much of the Berry Schools and urges Hammond to bring Martha Berry to see the exhibition. 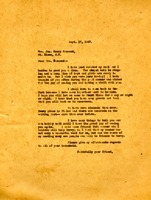 Berry writes to Hammond, describing the loneliness she feels following her (Berry's) mother's death. 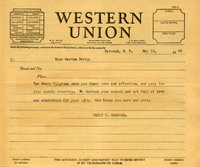 A receipt to Mrs. J.H. 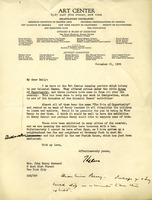 Hammond for $2500 for an endowed day in memory of Mrs. Waldo Richards. 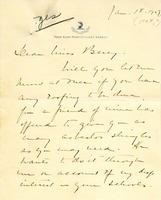 Alice Hammond Duckworth writes to thank Berry for the visit to the Berry Schools. Berry describes the 25th anniversary celebration with many alumni visiting, and describes feeling happy because the boys and girls are willing to sacrifice. Hammond inquires about the need for roofing, as she has a friend who has offered as many asbestos shingles as are needed. 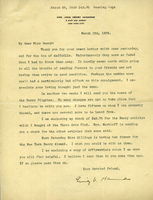 Berry has many things to tell Hammond and will be returning to New York soon. She feels that though Hammond has many guests, she will "tuck me in somewhere." 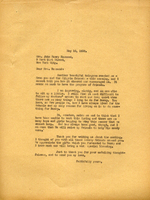 Hammond writes to Martha Berry with news on the upcoming pilgrimage and her family.